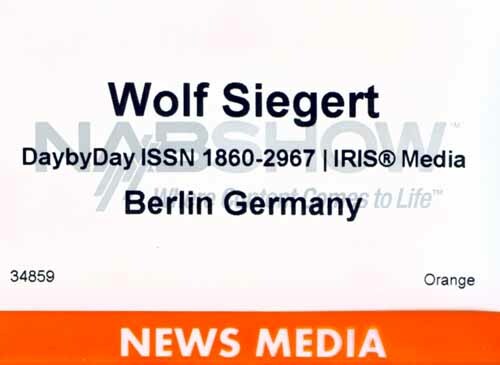 Heute ist der erste Konferenztag der NABShow 2009. After a fast start, the transition of theaters from 35mm film to digital cinema has apparently stalled, largely due to restricted financial markets. However over 4,000 systems are in daily operation in the US, providing benefits to the exhibitors, studios and movie fans. This session will explore the lessons learned from the leaders in the digital cinema roll-out. The panel will also look into the future, with analysis on what it will take to keep the digital conversion on-track, and take advantage of the many opportunities and new business models made possible by D-Cinema. Chuck Goldwater , President, Media Services Group, Cinedigm Digital Cinema Corp.
10:15 a.m. - 10:35 a.m. 3D Releases - How Many Screens Are Enough? Hollywood has embraced Stereoscopic motion pictures and many new productions are currently in the pipeline for release in 2009 and beyond. These include major projects such as "Monsters vs. Aliens" and James Cameron’s much-anticipated "Avatar". But will there be enough 3D screens to meet the demand? This session will review the trends for new stereoscopic releases, and explore the impact on exhibitors and distributors. The Digital Cinema Initiative, LLC (DCI) continues their pioneering work in defining requirements, standards and compliance testing criteria. This work has proven to be a key enabler for the successful roll-out of digital cinema in the US and overseas. This session will provide an update on recent work by the DCI, and plans for 2009. Recent advances in projection technology have enabled brighter, bigger and more immersive stereoscopic 3D images for digital cinema. In this session, experts in 3D imaging will provide an update on recent advances and developments for theatrical 3D, and take a look into the future of projection technology. This past year has seen remarkable progress toward creating standards for 3D programming. These efforts have included defining technical requirements, documenting use cases and investigating current technologies that are being used for 3D, including for the home. This session will provide an overview of these efforts, and explain the foundational work already achieved. A survey of standards bodies involved in the process will put these efforts into context, and provide a glimpse into the substantial work remaining in the standardization efforts. Wendy Aylsworth , Senior Vice President, Warner Bros. The National Association of Theater Owners (NATO) represents owners and operators of over 30,000 movie screens in the US. Digital Cinema pioneer Michael Karagosian will provide an update on the state of the digital roll-out, from the exhibitor perspective. 3D Rules... From Learning them to Breaking them in Seconds Flat: A Discussion of Making My Bloody Valentine 3D from Concept to Completion. 2:15 p.m. - 3:00 p.m. Stereoscopic Vision - How do We See in 3D? The human visual system has the remarkable ability to perceive depth based on a combination many factors, including perspective, occlusion, shading and binocular parallax. But how does the brain perceive 3D as displayed on a cinema screen or video monitor? This session will provide background on human stereoscopic perception, and explain how factors such viewing angle and screen size effect the viewer. A certain percentage of the population has impaired stereoscopic perception, and a viewer’s ability to perceive 3D changes as they get older. Understanding these factors will allow cinematographers to best achieve their creative goals for 3D cinema. For many filmmakers, 3D imaging has become an exciting tool to enhance the creative process of cinematic story-telling. But as with any tool, it must be fully understood and used with care. This session will provide a tutorial on stereoscopic imaging, including the effects of interaxial and convergence settings, camera positions, hyperstereo, depth budget and many other factors. This session will provide an overview of these important factors, with demonstrations of their visual effect. Experience is golden. In this panel discussion, expert stereographers will explain techniques used in recent motion pictures and 3D television productions, and show examples of footage demonstrating these techniques. While 3D content is becoming well established in the digital cinema, what are the factors that will enable distribution by broadcast, package media, IP download and mobile networks? What do we know about consumer demand for 3D? And what business, marketing and technical obstacles must be overcome? Motion picture studios have made substantial investment in producing and promoting 3D releases. But are there plans for getting these releases into home video window? Is there a market for 3D in syndication or pay-per-view? This panel of studio executives will explore these pivotal questions, and provide insight on how stereoscopic content will grow in the cinema, and beyond. Darcy Antonellis , Warner Bros.
With growing interest in delivering 3D movies and live events to the home, a variety of 3D encoding approaches have emerged to support the various home distribution channels. However, these distribution channels, such as optical media (Blu-ray Disc), cable TV, Internet download, and terrestrial TV, each have its own set of constraints, challenges, and requirements for legacy equipment compatibility. This session will review the various 3D encoding approaches, discuss the requirements of the different home distribution channels, and then attempt to predict the future rollout of 3D content to the home. Chris Yewdall , President & CEO, Dynamic Digital Depth, Inc.
CEA’s Technology and Standards Council is investigating the need for standards to address delivery and presentation of stereoscopic 3D video to the home. Toward this goal, a 3D Video Discovery Group has been formed to gather experts, share information on state of the art, and determine the need for standards within CEA’s domain. How practical are 3D televisions in the home? Will viewers always need to wear those funny glasses? Many technologies have been introduced for stereoscopic display, and others are emerging from research labs around the world. In this session, we’ll re-cap the available technologies for 3D display, including tradeoffs in price, performance and time to market. Projections for the update of 3D home displays will be reviewed. 3D is not just for movies anymore. The immersive experience of 3D television suggests that sports broadcasts have the potential of being the "killer app" with a potential double header: 3D television distributed live to digital cinema and directly to the home. Several noteworthy efforts in live sports broadcasts have recently been undertaken, and valuable lessons have been learned. Our panel will provide a behind the scenes look at recent 3D sporting events, review game footage, and debate the opportunities and obstacles to making stereoscopic sports coverage and distribution commonplace. The session will summarize the many exciting opportunities and vexing challenges to the widespread adoption of 3D. Clearly, stereoscopic treatment isn’t appropriate for all programming (is it? ), but what will be the killer applications that will drive adoption? How can the consumer electronics industry, broadcasters, distributers and Hollywood production community. Ein vertrauter Name, der diese Jahr nicht dabei sein wird, ist der von Patrick von Sychowski. In seiner Linked.in-Mitteilung vom 16. April 2009 ist zu lesen: "... is not going to NAB (too much Vegas, too soon) ..."
Kris Jones von der NAB ist dagegen wie jedes Jahr im Pressezentrum dabei und hat am Montag, den 20. April 2009 um 19:40 Uhr den Textentwurf der "State of the Industry" - Eröffnungsrede von "NAB President and CEO David K. Rehr" zugeschickt. Welcome. There is no other place that I’d rather be than right here, right now, with all of you. We are witnessing exciting changes in radio and television. Changes that seem to happen in a blink of an eye—changes that can seem unsettling. But from where I stand, these changes are opportunities for us to seize. The world is facing an economic crisis. That is unquestionable. But that isn’t stopping us. Right here, at the NAB Show, we are demonstrating that broadcasters are forging ahead, spurring innovation and creating multiple platforms to deliver our content. From moving 3D viewing into the home to incorporating FM chips in cell phones to exploring all the possibilities of the Internet. We are planning for the future and seizing opportunities in this digital age. Our journey to this moment has been swift. Our confidence tested. But our focus unwavering. We are faced with making some tough decisions to ensure a strong future for our business. But from this adversity, we are finding strength, and directing our energy towards creativity, innovation and tomorrow. We are taking control of our future. A few years ago, broadcasters were already putting in place plans to lead the industry into the future. Let’s take a look at the exciting journey we’ve been traveling these past few years and talk about our destination. There are great opportunities for radio and television, and I’m going to spend a few minutes talking about both today. First, I’ll talk about radio. Radio was at a critical juncture. The rise of MP3 players and other competing platforms made radio seem obsolete to some people. They said radio wasn’t adapting to the digital age. They said that listenership was declining and that radio was a medium of the past. But we knew they were wrong, and we set out to prove it. Two years ago, we launched Radio 2020 - an initiative to ensure radio’s value will be recognized well into the future. We joined with the Radio Advertising Bureau and the HD Digital Radio Alliance to have "one voice" for radio. We spent countless months and considerable dollars looking at radio’s perception and determined a strategy to "revitalize" this great medium. Radio 2020 is a 12-year commitment to set any misperceptions right, and build on the "love affair" listeners have with radio. Last year, at this very show, we launched the consumer phase of Radio 2020 - the Radio Heard Here campaign. With Radio Heard Here, we’re reminding everyone — the radio business, advertising community, electronics industry and listener that radio has a great impact on people’s lives. We have a wide spectrum of initiatives that are engaging virtually the entire ecosystem that radio touches. That includes the 235 million people that tune in each week. We’re working with technology companies to showcase new innovation. We’re fostering a new generation of radio listeners and reaching out to them through our Web site, blogs and social networking. And spots like this one are playing in hundreds of markets across the country, reminding listeners why they love radio. The entire industry has united behind this initiative to reignite the passion for radio. Earlier this month, we surveyed radio insiders about Radio Heard Here. And nearly 90 percent said campaign tools that help the industry convey the power of radio are making a difference. Our goal for radio is simple, yet focused: Wherever there is a speaker or a pair of headphones, radio will be there. We must continue to tell radio’s story. Because ladies and gentlemen, radio is moving forward. This brings me to Internet streaming. It’s another way of bringing radio to the listeners. Much of Internet listening by Americans comes from local radio stations streaming. A recent Arbitron study notes that an estimated 42 million Americans listen to radio online each week. NAB recently negotiated a deal with Sound Exchange to ensure radio stations can continue to stream online, and more stations can begin to stream in the future. The deal provides more reasonable streaming rates and ensures certainty of costs through 2015. We also negotiated deals with the four major record labels, which provide flexibility in promoting artists and songs as stations stream. But online listening isn’t the only way radio fans are enjoying new choices. HD Radio technology means not only crystal clear sound, but more channels, new formats and new content. NAB is working with the HD Digital Radio Alliance to educate the public, manufacturers and the auto industry about the great benefits of HD Radio. Automakers offering HD Radio features as factory or dealer options span 14 brands across 82 models. We also must continue to push more receivers into the marketplace. We’ve also been reaching out to U.S. mobile phone carriers to include FM chips in cell phones. This brings radio to upwards of 250 million devices in consumers’ hands. FM receivers in cell phones could provide another revenue stream for cellular network providers. And integrated FM receivers would give cell phone users access to the Emergency Alert System. These announcements are relied upon as a lifeline for Americans during emergencies, and we’re getting a great response. Verizon Wireless, AT&T and T-Mobile are including FM radio-capable handset devices in their offerings. And we’re working to get Apple on board as well. Now, let’s turn to the journey television has taken and the opportunities, which are immense. We know that these past several years have been challenging for television. We’ve adapted to many changes in the marketplace, in consumers’ tastes, in technolog and in the economy. But in 2005, when Congress mandated full-power TV stations transition to digital, broadcasters took the lead in this digital revolution. The entire TV industry united behind a consumer education campaign valued at more than one billion dollars. We put this campaign in front of America — on TV, on ships, on planes, on buses, at bus stops, in subways, on billboards, on the radio, on the Internet, at county fairs and public events, in parking lots, and in more than 8,300 community meetings with presentations by over 1,000 broadcasters. And we united more than 240 business, trade, industry, consumer groups, and grassroots organizations in these efforts with the Digital TV Transition Coalition. And this campaign has been extremely successful. By January, 97 percent of Americans were aware of the transition. Many viewers are already enjoying the benefits of DTV - crystal clear pictures, phenomenal sound and more programming choices - all for free. And high definition television - HDTV — the jewel of digital broadcasting - is offering clarity of picture and sound beyond anything else available. Over the past year, there has been a 57 percent increase in the number of stations offering their newscasts in high definition. Not since the first color TV sets entered American homes have we experienced such a revolution in television viewing. More than 600 stations across America have already encountered a smooth and successful transition proving that the tireless efforts of TV broadcasters to prepare their viewers paid off and reminding all of us of the continued power of broadcast television. In fact, the DTV transition has allowed TV broadcasters the opportunity to re-brand and reinvent. The move to digital television has allowed us to move forward in making local, digital broadcast TV portable. NAB provided the seed money to support the Open Mobile Video Coalition - more than 800 television stations working to bring digital television to mobile and handheld devices. By 2012, we expect 130 million phones and 25 million media players will be able to receive mobile television. An NAB study concluded that TV broadcasters could see incremental revenue of more than $2 billion after 2012 with mobile DTV. I believe, the revenue upside is probably greater than we can even imagine. There are billions of dollars in mobile ad revenues and billions of dollars in mobile search revenues and broadcasters should get their fair share. And this doesn’t take into account the way mobile television will transform the TV viewing experience. We must focus on how broadcasters can be well positioned to capture these opportunities. And this mobile DTV revolution has already begun. Mobile digital television will launch across 66 stations and 27 markets…covering 38 percent of U.S. television households…and more will follow. Television broadcasters are moving TV beyond the bedroom, living room or kitchen. That means watching "Lost" on your handheld media player or "Heroes" on your cell phone. That means anywhere you are, you can access the news or your favorite shows. Over the past few years, we have seen an amazing transformation in radio and television. It has been an incredible journey, but it hasn’t always been a smooth one…we’ve encountered some turbulence. But we must keep our eye on tomorrow. I know many of you are thinking, " How do we do that during these tough economic times?" First, we must make the best use of our resources. Our financial decisions must reflect the priorities and mission of our businesses. We must allocate dollars toward accelerating tomorrow. With this in mind, three years ago, NAB established a multiyear, multimillion dollar technology advocacy program, called FASTROAD. This program is helping us explore, develop and accelerate the adoption of new broadcast technologies. FASTROAD reports have helped forecast the potential benefits of mobile DTV and FM radios in cell phones. And we’re investing in the development of technologies ranging from DTV sets with smart antennas that can automatically configure themselves for best reception, to improving the reception and services offered by HD Radio. You know, every year computer manufacturers produce upwards of 40 million digital TV screens. We, of course, currently know them as laptop computers. Our FASTROAD program is working with manufacturers and their sub-system suppliers on how to incorporate DTV reception in laptop computers…both the chip and the antenna…so receiving digital television will be easier than connecting to Wi-Fi. Second, we must work together to continue to accelerate technology and think of our business in new ways. We have recently seen a dramatic increase in online content being produced by broadcasters. Often it is a complement to programs broadcast on regular TV or the radio. The Web is transforming the way we perceive a community and how we engage in it. Social networking sites like Facebook and Twitter will continue to change the way we communicate with people and share information. And more people are going to the Internet to listen to radio and watch their favorite TV shows. But with more than one hundred million blogs, growing at a rate of 40,000 a day, and over 2 billion Web sites, those industries that are successful will have to cut through the clutter. And unlike many industries, we are in a unique position to do just that. Our brands are unmatched in our markets. We know the power of radio and television. And using radio and television, we can drive consumers online. And once there, we can provide them with greater access to our advertising partners, further monetizing our platforms and theirs. Consumers will follow us online because they’ve followed us and our great content for years. And third, we must maintain a realistic optimism. We may feel beaten down by the economy or influenced by some intent on negatively portraying radio and television. But together, we are the pilots keeping us on course to our destination - a positive and successful future. You know, nearly every industry in America faces tough economic times, but I have to tell you, right here, right now, not many of them are as well-positioned to succeed as we are. Why? Because, during a time when there are more media choices than ever before in the history of the world, radio listenership is growing. Ninety-two percent of Americans say radio plays an important part in their lives. And, there has been more innovation in radio in the last five years than in the past 50. Viewership is increasing. In fact, it’s up seven percent since 2000. And though we’re providing more platforms for consumers to enjoy our content, 99 percent of video viewing was done on television in the past year. That speaks to our continued strength. Broadcast TV stations are on the path to achieve 1.3 billion dollars in interactive sales, a 26 percent growth rate this year. And in broadcast TV, we often forget the strength of our content. In the 2007-2008 television season, broadcast content accounted for 488 of the top 500 programs watched in primetime. That’s a 98 percent market share. Ladies and gentlemen, radio and television are aggressively planning for the future. Though we’re focused on the future, we can find inspiration in the way great leaders faced adversity and change in the past. "Far better it is to dare mighty things, to win glorious triumphs, even though checkered by failure, than to rank with those poor spirits who neither enjoy nor suffer much, because they live in the gray twilight that knows neither victory nor defeat." Television and radio broadcasters are daring mighty things, forging ahead and spurring innovation that’s taking us into the future. And though we may stumble at times on our way toward victory, we will always keep our eye on tomorrow. We will not sit idle in the gray twilight that knows neither victory nor defeat. We will dare to do mighty things. And we, America’s radio and television broadcasters, will triumph. Die kursiv gesetzten Zeilen ensprechen den Texten aus der offiziellen Ankündigung. Die Absicht, diese dann vor Ort zu kommentieren, musste "ad acta" gelegt werden, nachdem durch einen Einbruch in das berliner Büro die Reise hat abgesagt werden müssen. Zwischenzeitlich wurden Kollegen und Freunde angeschrieben, Ihrerseits über diese beiden Tage zu berichten. Und wir werden daher hoffentlich zu gegebener Zeit noch einmal auf dieses Wochenende zu sprechen kommen können. "Peter": The last but by all means least in this list of speakers, who made it to the panel as one of the very few non-US-branded names :-) Why is there no online-participants-profile available? And why dosn’t it say "EDCF" eighter?